Fermentation is one of the hottest kitchen trends of the past two years, and for good reason- fermentation allows us to transform the ordinary to the extraordinary (think: delicious pickles, olives, and ginger beer). But more than that, fermented foods have enhanced nutritional value, aid in digestion, and regulate our immune systems. Fermentation is fun and it results in foods packed full of flavour and health benefits. 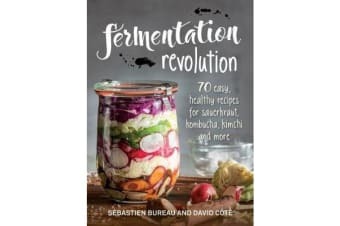 Fermentation Revolution provides 70 easy, step-by-step, and costeffective recipes for everything from fermented vegetables, fruits, sugars and honey to milks, cereals, grains and legumes. It covers the science behind fermentation, different types of fermentation processes and useful fermentation equipment. So gather your jars, get started on making your own condiments and yogurts, and be on your way to cultivating good health. Your taste buds will be sure to thank you.